Hundreds of name brand cigars, humidors and accessories - all at discount prices! 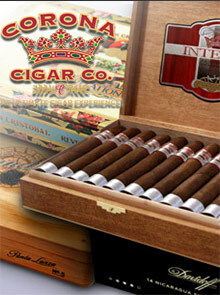 Corona Cigar Company features hundreds of name brand cigars, humidors and accessories - all at discount prices! Choose from your favorite cigar brands such as Avo, Ashton, C.A.O., Corona Intensa, Corona Ranchero, Montecristo, Partagas, Padron, Punch and Romeo y Julieta - just to name a few. They also carry all of the accessories you'll need to store and enjoy your cigars, including cigar cutters, ashtrays, and lighters. Choose from a line of personal humidors to keep your collection at its peak flavor, or travel humidors to carry a few favorites with you away from home.